The Elementary Education Act 1870 brought forward compulsory education of all the children in the land, and, in the case of our village school, Gloucester Diocese had charge of this. And from then on, plans were made to build a proper school on a patch of land opposite to the then cottage school. 'Aunt Amy' living in her later years at the three storey house (No. 28) could remember in her school years, helping to carry the school books and slates across the road from the cottage school and into the new school. The building of this new Church of England School was finished in 1882, with the addition of a bell to summon the children to school. A house known as the Church House was built in the churchyard before 1548 by the parishioners for the poor of the parish. In the 1670's Henry Dighton wrongfully took possession of the house which he was made to restore to the churchwardens and overseers in 1683 and in the 18th century the house was used for the school. The master was chosen by the freeholders and the school was held in the house built by the parish for the poor. After 1817 the school was discontinued because a master could not be found; a small allowance from the charity was made to the Sunday School teacher, the rest being allowed to accumulate so that it could be used to provide an adequate salary for a teacher. In 1914 the Board of Education agreed to a Scheme whereby Jackson's charity was transferred from the school and used for further education. Part of the 43 a. belonging to the Charity was sold in 1958 and in 1962 a considerable surplus from income had accumulated. In 1872 a National school was opened in the house where the earlier school had been held, which had been enlarged in 1871. From 1879 the school received a grant which, however, was partly withheld in 1882 because of the inadequacy of the teaching. 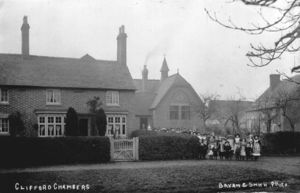 The schoolmaster was replaced in that year by a certificated mistress, and a new school, a small brick building standing back from the village street opposite The Square was opened in 1883. The average attendance was 64 in 1892 and by 1911 the school had a separate infants' department. It became an infant and junior school in 1939, the older children going to schools in Straford,. In 1962 the number of pupils was c.40 and land had been bought for a new school to be built. Those in the village when I arrived there, had only memories of Miss Wilding as the main teacher – and no-one could ever forget her! Practically every small child entered the school premises in fear. Once inside, many of them had to sit under the penetrating, powerful eye of Miss Wilding. She produced such fear in the children that they were frightened of her even before they started school! Many little ones, starting on their first day, were carried or dragged by their mothers to the school door, their screams being heard along the village street. Kath Radbourne, when she started school at the age of 5, was sick every morning as soon as her mother, after breakfast said, “Time for School!” When, at the age of 14, she went out of the school door for the last time, she felt so free – even though, for the rest of her life, she was employed as housemaid! Such was the fear of every small child in that school – and many of the older ones too - of Miss Wilding! No-one sniffed, blinked, twitched or moved a muscle without Miss Wilding’s permission. She had as many as 90 pupils at one time, ranging from 5 to 14, and they all left the school with an extremely good standard of education. Some of them passed the entrance exam to the Grammar Schools, and those of her pupils who were still living in the village at the time I took these notes, although they trembled before her at the time, told me what a good teacher she was. I have seen a Handwriting Book in beautiful copperplate handwriting, written by a 6yr old. Just one sentence was written over and over again throughout the book by this little boy. “I promise that I will not drink any intoxicating beverage.”! 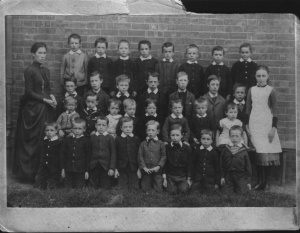 Miss Doris Dodd took the infants. Miss Kendrick standards 2 and 3, and Miss Wilding the older children. Much to the envy of the girls, all the boys had art with Miss Dodd while they, poor things, had needlework under the eagle eye of Miss Wilding. Miss Wilding also introduced musical drill and nature walks. Their nature walks during the First World War were to Galley Oak to pick blackberries to be made into jam for the troops. If a child dared to bring back less than quarter of a pound – then the cane awaited them. Only once did Miss Wilding make a mistake. “That is NOT RIGHT” she announced to Reg Hewins drumming her pencil fiercely onto the top of his head. Unfortunately, she didn’t check that the pencil was the right way up for a punishment of that kind. It wasn’t! The sharp point scraped against Reg’s skull. There was much blood and much Mrs. Cuckoo Hewins threatening legal action! After that, Mr. James allowed Miss Wilding to walk through the door in his wall to reach the school and to go back home at the end of the day via his garden, and from his garden to The Nashes and on to The Lindens where she lived. This was to avoid her walking past an irate and watchful Mrs. Cuckoo Hewins waiting for her at her garden gate! From then on, until she retired, she walked that way with her erect bearing, reminding one very much of Queen Mary. One child defied her. He was the only one who did not cringe before her terrible gaze. Caning did nothing to him except make him more defiant. In desperation one day, Miss Wilding turned for help to Col. Studley who was staying at the Manor then. He brought along his riding crop, and horse-whipped him, but even that didn’t break the spirit of the lad. He carried on in his defiant way all through school. However, just before embarking to France in the First World War to join his troop, he turned up at school in his uniform and publicly apologised to Miss Wilding for his waywardness while at school. Miss Wilding was so touched by it, she had him march all the children out into the playgound and teach them drill. Sadly, he was killed shortly afterwards, in action. Mrs. Rees-Mogg liked to have the children recognize her when her chauffeur drove her along the village street. But if a child – or children – did not raise a hand to their caps in acknowledgement of her presence, or in the case of the girls, give a little bob of a curtsey, she reported it to Canon Brookes. There were some tender moments to Miss Wilding. When the funeral procession carrying her father’s coffin passed what is now our bus stop, she saw four little lads on their own, take their caps off and hold them to their chests as a sign of respect. Miss Wilding cried. She told someone afterwards that she could have hugged them for their act of solemnity and reverence. in the Church of England School retired last week. excellent work she had done in the school and out of school during all these years. The Parish of Clifford Chambers and the nearby Parishes had, from possibly the Domesday Book and maybe even further back in time, been in the County of Gloucester. But from 1931 onwards, the Government decided to straighten all County Boundaries and remove the sections protruding into another County, and as our part of Gloucester definitely protruded, like a pointing finger, into the County of Warwickshire, this 'finger' was promptly removed from the County of Gloucester and placed in the County of Warwick. Problems arose however, when the Parochial Church Council (probably at the request of Mrs,. Rees-Mogg) decided that, although the Parish was now in the County of Warwick, the Church and the Church property (being the Rectory, the Village School and the Recreation Ground used by the School as their playing field) would remain in the Diocese of Gloucester. 30th April 1957 The school was to be decorated by the Authority during mid-summer. Church funds were not adequate enough to keep the building in good repair. 8th April 1958 The school had been taken over by the Education Authority on 9th December 1957. An official of the Authority had visited the school and expressed the wish that the Managers at their next meeting would agree to the work being started on the new sanitary arrangements during the summer holiday. The Official informed the Head Teacher that the entire reconstruction of the school would be completed within the next two years. The new Instrument of Managers had been duly signed and sealed. It was necessary for the PCC to appoint one person as a Foundation manager, not necessarily a member of the PCC. Mrs. Lake proposed Mrs. Spragge seconded by Miss M. James. This was carried. Miss Doris Dodd's illness The Rector expressed the general regret of the village and parish that due to her failing health, she had had to resign her teaching post in the school after forty years. She was continuing as Choirmistress and mentioned her nephew Alex Dodd was officiating at the organ, It was hoped that after an operation, she would be able to resume duties at the organ. 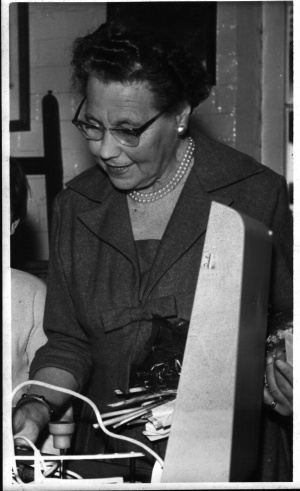 In 1951, Miss Hodgson took over from Mrs. Timperley, and when Miss Hodgson retired, Miss Win Baker arrived, living at No. 33 The Square. 6th February 1976 The School Closure. As this is a controlled school, we are not directly responsible but as the buildings belong to the Diocese, it was felt that we should add or voice the views of the parents, School Managers and the Parish Council by sending a letter against the closure. 23rd July 1976 School Closure Ownership of property stand???? Diocese said that any proceeds be used for Education properties as this was stated in the deeds. Warwickshire County Council Education Department say proceeds should go to them. It was agreed that the Solicitors of both sides would have to sort this out, but we hoped we should be consulted on any plans The film screen and projector was given by the Charities, and it was felt that these should be returned to them for ????? The piano would go to replace the one in the Church. 30th September 1976 All removable property removed. Gloucester are in process of disclosure with the Ministry regarding sale of the building etc. Clifford would get nothing for the sale. According to the deeds and the 1973 Act of Parliament, the School by law has to be sold and the money invested with other Church Schools in the Diocese. 11th February 1977 The School is now free to be sold, but Clifford would get nothing from this sale. After much discussion, the Rector will try to get the Diocesan Education man to Clifford to discuss this matter with us. After Miss Wilding, came Mrs. Baxter, followed in 1931 by Mrs. Groely, then Mrs. Russeau. Then, in 1936 came Mrs. Timperley. During her time as teacher, Secondary Schools for boys and girls were built in 1939, in Stratford-upon-Avon, and Clifford became just a Primary School. 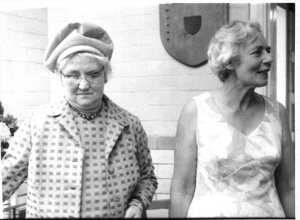 (At a “Thank You” service held at the Church on 22nd July 1990, special thanks were given for the life of Mrs. Millicent Timperley – a much loved headmistress at Clifford School from 1937 to 1951. She was also a staunch supporter and active member of the Mothers Union and Women's Institute, and in her latter years, of the over 60's Club. The Church however, was the centre of her life and beautifully embroidered alms bags were given o the Church in memory of her life and dedicated at the Thank You service. Wednesdays were always ‘Church morning’! We either went across the road to Church, or Canon Brookes came to the school. Miss Dodd took the infants, and I can still see her, stood with her back to the fire warming her backside, when we were frozen! Mrs. Timperley ran the juniors. She had a cane which was used! Along with the 3 R’s, the girls did knitting and sewing while the boys did gardening. Mrs. Timperley suffered from asthma, and the fumes from the pot-bellied stove in the corner could not have helped! On cold mornings, bottles of milk were put round the stove to defrost the ice on them. At the First Meeting of the Parish Council of the Parish of Clifford Chambers held at the National School Clifford Chambers on Wednesday the 19th day of December 1894 at 6.oclock in the evening. Vice Chairman of this Council to hold office until the Annual Meeting in April next. as may be hereafter fixed. the duties of such office. Also, in 1886, extensive work was done at the Church, and it was no longer possible to hold services there. So the services were taken in the school and scholars then found themselves gazing at their school walls on a Sunday, this time sitting with their parents. And then The End came. The school was sold and bought by Mr. Chris Ironmonger who moved in with his young family. So, although it was a house now and not a School, there were plenty of sounds of children's laughter in the house and grounds. And the building still looks a School more than a house! This page was last modified on 11 February 2014, at 23:48.